Every marina usually has at least one: the classic, stylish sail or motor yacht that stands out among all others. These floating artifacts, many from the glory years of boat building, represent an era when graceful exterior lines, teak or mahogany decks, loads of chrome, brass, and bronze deck and interior fittings, elegant, wood-paneled cabins, traditional helm stations, and steam, diesel, or gasoline propulsion systems were the norm. Owning, operating, and maintaining a classic power or sailing yacht is demanding and costly, but also rewarding. A classic vessel, especially those with wooden hulls, requires not only boatloads of scraping, painting, varnishing, and repairing, but historical research, frustrating searches for obsolete parts and fittings, fabricating unavailable equipment, and learning hull and equipment maintenance techniques that have been largely forgotten. 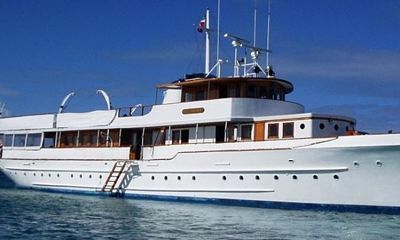 These traditional yachts were built during an era in American — and world — history known as the Gilded Age, between the 1920s and early 1930s, when worldwide industrialists, business and political leaders, presidents, kings and queens, and others used their fortunes or status to commission motor and sail vessels designed with exacting specifications and comforts, which at the time were state of the art. Today, after painstaking restoration and constant maintenance, many of these elegant watercraft still the ply the Seven Seas and are available for charter, special events, or tours. Many historic sail and power vessels are listed on the National Register of Historic Places or have achieved National Historic Landmark status (even though they float!). Any discussion of yachts among sail and power boaters often centers on what makes a boat a yacht. While there is no official designation of size, amenities, or other features that make a boat a yacht, some background might be helpful. The word yacht originated from the Dutch word for hunt, which, interestingly, was first used to define a light, fast sailing vessel used by the Dutch Navy during the 1600s to pursue pirates and other water-borne rogues around the shallow waters of Holland and the Low Countries. In 1660, with King Charles II of England exiled in Holland, a sailing vessel of this type was used to carry the king back to England to reclaim the English crown. As a result, the term came to mean a vessel used to convey important persons, a meaning that could still be appropriate in the 21st Century. Prior to the 19th century, boats were used almost exclusively for working, functional purposes rather than for pleasure. In 1857, Henry David Thoreau, the popular American writer and philosopher, wrote Canoeing in Wilderness, a book that chronicled his canoeing adventures in the wilds of Maine. Thoreau’s work is believed to be the first to describe the spiritual and lifestyle pleasures derived from cruising, albeit in a very small boat. The book seemed to spawn a newfound interest in recreational boating pursuits. In modern use, the term yacht typically defines either a sail or power watercraft over a certain length that is used for pleasure. Simply stated, a yacht is a recreational vessel that has adequate length to offer a range of on-board amenities, such as sleeping cabins, salons, galleys, and heads, typically ranging in length from 39 to hundreds of feet. A luxury craft smaller than 39 feet is commonly called a cabin cruiser; a super yacht generally refers to a power vessel above 79 feet; a mega yacht usually describes a power vessel over 164 feet. Also a good indicator is the cost of building and maintaining a yacht, which is directly proportional to length: the longer the yacht, the more expensive. Except for the sportfishing category, sailing yachts could be classified in a similar fashion. Because of their size, stability, on-board amenities, and length, the most popular use of yachts is for extended (more than a day or two) pleasure cruising, whether on the Great Lakes, the Atlantic, the Mediterranean, or island-hopping in the South Pacific or Caribbean. Safe, long-distance sail or power yacht cruising requires a high level of self-sufficiency. For example, a working knowledge of navigation, meteorology, mechanical/electric/electronic systems, satellite/radio communications, survival, and many more are required. In the US, several organizations offer courses to acquire these skills. The United States Coast Guard requires that vessels over a certain length be crewed by masters and crews with extensive boat handling experience and Safety Of Life At Sea (SOLAS) qualifications. GetMyBoat supports its members by its relationship with the Classic Yacht Association (CYA), an organization that promotes and encourages the restoration, preservation, and maintenance of traditional power-driven and sail pleasure craft. CYA requirements for boat membership are generally that the vessel be of good design and construction, properly maintained, built prior to December 31, 1959, and have no external alterations that detract from original design intent. The CYA has become a major influence in the growing awareness and appreciation of classic sail and motor yachts. The association and its five fleets sponsor annual events that focus attention on the unique craftsmanship and design of vessels built during the Gilded Age. Activities for members and their vessels cultivate a spirit of camaraderie among those interested in watercraft that have weathered the test of time and technology. CYA has more than 600 registered sail and power yachts in California, the Pacific Northwest, Canada, and non-West Coast areas. There are many websites dedicated to classic yachts that have been restored, are under restoration, or have not survived the ravages of time or neglect. 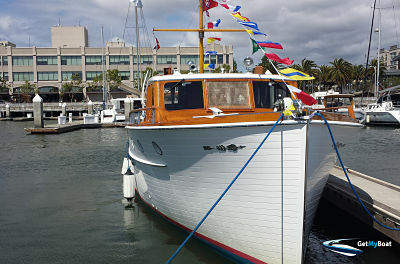 These sites represent the extraordinary efforts by classic yacht enthusiasts around the U.S. and the globe to preserve classic sail and motor yachts and, in many cases, maintain them in operational condition for special events, tours, or charter. Check out the Mariners’ Museum and Park in Newport News, Virgina; the Mystic Seaport at the Museum of America and the Sea in Connecticut; and the San Francisco Maritime National Historic Park. The International Yacht Restoration School in Newport, Rhode Island and the Historic Naval Ships Association offer great resources, while the USS Constitution and the USS Constellation each have sites dedicated to them. Whatever the size of your vessel, you have carte blanche to call it a yacht — and to enjoy the pleasures of cruising, even if it is not a classic!